Great fun, works well on stage and looks cool, though acoustic performance is compromised. Has the fun factor and is highly playable. Good build and nice setup for the entry-level market. Not the most balanced acoustic sound we've heard. The big F has never exactly been renowned as an acoustic guitar brand. 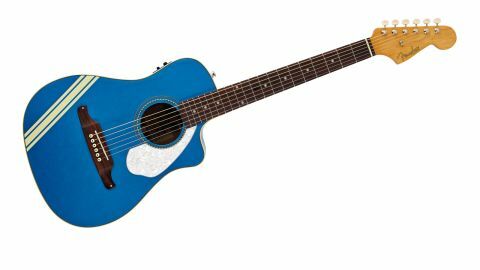 Yet back in the 1960s and riding high on the unprecedented success of its solidbody guitars, it entered the acoustic world in typically mould-breaking fashion. Bolt-on necks, Stratocaster-style headstocks and an unusual approach to top bracing were the order of the day, presided over by one Roger Rossmeisl who'd recently arrived from Rickenbacker. Despite being seen with some high profile artists, however, Fender cut the strings on its original, American-built acoustic instruments in 1971, though acoustic guitars have appeared from its Asia-based factories in every decade since. Fender's budget-level Malibu model first appeared all the way back in 1965 as a folk-sized instrument. Today's FSR CE model is smaller-bodied than that, and now features a modern-style cutaway; cutaways certainly weren't run of the mill back in the mid-1960s. "It's such a far cry from what you could have expected 20 years ago; a decent on-board preamp and tuner would have seemed like fantasy back then"
Gone is the bolt-on neck, replaced with a more conventional dovetail joint, and inside you'll find traditional X bracing supporting the laminated spruce top. Fender specs it as scalloped; it's certainly shaped to remove some of the mass. The 13.5-inch wide body may give the impression that this is a travel guitar, but with a full 643mm scale it is in fact just under an inch longer than a Stratocaster from endpin to headstock tip. Travel with it by all means, but a dinky plinky this is not. It's a nice to find a GraphTech NuBone nut on the Malibu - and the guitar is set up to play very well straight out of the box: stable tuning, easy actions - exactly the kind of experience that will encourage you to play more. The Malibu's competition stripe aesthetic detail is courtesy of limited edition status, and pays homage to the Mustang design of the mid sixties that also used the stripe. There's something about it over Lake Placid Blue and Candy Apple Red finishes that's just so instantly retro, in our opinion, and balanced visually with the white-coloured tuning buttons. There are factory-fitted strap buttons so you can stand confidently on stage, plugged in via the Fishman Isys III electronics package. This comprises an under-saddle Sonicore pickup with a smart, modern-looking preamp housed in the guitar's upper bout. Again, it's such a far cry from what you could have expected 20 years ago; a decent on-board preamp and tuner with LED readout would have seemed like fantasy back then. Finished with tidy binding, an attractive checker rosette and quirky-shaped pickguard, this surpasses cheapo-box status by a massive margin; in fact during its time with us, it was hard to liberate from anyone who picked it up. The neck is maple and with a comfortable C profile and medium nut width (measured to 42.8mm) and feels instantly familiar to anyone au fait with a Stratocaster, for example, not least because of that unmistakable six-on-a-side Strat headstock. If you've played your share of Fender electrics, you'll find yourself tempted into more electric-like phrases; it's entirely in your head, but the maple definitely makes us think more 'electric' when playing. "It makes a good accompaniment for voices, and a satisfying blues picker as well"
There's a reasonable radius to the rosewood fingerboard - measured at something close to 12 inches - enhancing the electric-friendly feel and as we said earlier, the inviting setup and easy action provide no barriers for fun. As you might expect, the smallish-bodied Malibu has a tight, focussed sound, but it's not as boxy or rudimentary sounding as we'd expected. In fact it makes a good accompaniment for voices, and a satisfying blues picker as well. Wonderfully sweet, balanced and poised it's not, but if you crave that, think about sticking an extra '1' on the front of the Malibu's price tag. Plugged in is where the Malibu's smaller body pays dividends as it's less prone to problematic feedback, so in addition to its starter status, we could see this being the choice of electric players needing an occasional electro for certain songs in the set, not to mention one that's not so precious you're scared to take it out! Plugged in, the Fishman Isys III returns a dependable under-saddle piezo-type tone; a good strong output and enough on board EQ to boost or cut bass, middle and treble frequencies; we'd be more than happy using this on gigs and open mics. The Malibu makes a good choice if you want to play plugged in, in a loud band, or perhaps where space is an issue. What it definitely has is the feel good, fun factor and that goes a long way.